April 1, 2018 - Happy Easter! Or is it Apirl Fool's Day? Whatever you're celebrating, the Easter Bunny wants no part of it in Egg City, the latest Weird Realms Holiday Red Bat adventure. January 2, 2018 - Happy New Year! We're getting ready to wobble into 2018, among other things. Maybe we'll even save another holiday from some nefarious plan or other. July 7, 2017 - The book you didn't even know you were waiting for is finally here! Qalidar Qritters has monsters! Lots of monsters! That's all it is! Monsters! Be excited! March 21, 2017 - Welcome to Spring or whatever. Our group's Gen Con events are posted, so why not take a look and decide which ones you want to sign up for before registration opens? December 20, 2016 - Check out our first Weird Realms Fantasy Setting, The Santa Lands! Just in time for Christmas! And don't forget we're running games at BASHCon in February and Weird Realms all the time. November 29, 2016 - Back from Carnage with convention reports from Tom and Robin. There's wobbling in the works, among other things, and we're slowly piecing together our BASHCon plans as we careen through the holidays. We've also been doing some gaming at a brand new local venue, Weird Realms. Check it out if you're anywhere near Cleveland! July 25, 2016 - New Qalidar thingie! The Fire Within provides for advancement up to level 20 (Basic only went to 5) and gives you the scoop on the Stardust as well. It also expands the rules for organizations and gives you some new goodies for players. Click here to get it! And yeah, of course we're getting ready for Gen Con. June 21, 2016 - Yeah, it has been a while, but we -- wait, we already did this joke, didn't we? Oh, well. Origins was a lot of fun. There's stuff in the works for SPACERS, Wobble, and probably other things. And of course we're getting ready for Gen Con! April 28, 2016 - Yeah, it has been a while, but we promise we haven't been smoking scorpion venom. There's stuff in the works for SPACERS, Wobble, and probably other things. And of course we're getting ready for convention season. This year, Origins is back on the menu! January 19, 2016 - Just in time for BASHCon, (okay, in plenty of time, really) SPACERS is back! It's the hip nickname for those that travel in space. The universe around them may use labels like "fly-bys" and "crashlanders" and "red bats" but everyone knows that one has to add the words “in space” to every sentence of their biographies, and everyone knows -- or should know -- to click here to get in on the game! January 11, 2016 - RIP David Bowie. We've got a whole slew of moonage-worthy adventures ready for BASHCon, though, so... Yeah, I guess that doesn't really help. October 31, 2015 - Happy Halloween! We're celebrating with a brand new Crawlspace adventure. It's a bit like the foreign horror comedy that someone recorded off of cable at 3:00 a.m., or the oddball VHS from the public library from back when only the video store had the "good stuff." If you don't know what to make of this, don't worry. Click here to find out for yourself! October 13, 2015 - We're getting into the Halloween spirit and getting ready for Carnage. Looking forward to running Crawlspace, Glow, Tunnels & Trolls, Red Bat Cthulhu, and all kinds of other great games! August 8, 2015 - Back from another awesome Gen Con! Robin, Tom, and Jerry have all blogged about the experience. Now it's time to start gearing up for Carnage! July 21, 2015 - We've got something new for your Red Bat gaming enjoyment, CTHULHU! Perhaps most terrifying of all, it's free! free! FREEEEEEE! June 23, 2015 - We're getting ready for Gen Con, closing in on a new Qalidar supplement, and maybe even getting some new Red Bat stuff ready to go. And there's a forum again. Pop in and say hello! May 2, 2015 - The forums have been trashed by the latest PHP "upgrade," so right now you can read, but posting doesn't work. Upgrading to newer versions of the the current software just crashed it entirely, so we're looking into other options. April 5, 2015 - The end is near! Actually, it happened a long time ago, and you can find out all about it in the pages of Glow, a new post-apocalyptic setting for the Red Bat system. April 1, 2015 - Since not many people get D&D, we've decided to reach out to a wider audience. Do you dream of being a sports hero but don't like to exercise or go outside? Now you can role-play it, instead! Become a great pitcher by rolling percentile dice! Use the power of your imagination to transform that that hot pocket stain on your pants into red clay from sliding into the bases! Fight demons with Babe Ruth and Joe DiMaggio! Red Bat: Baseball the RPG is only $19.95! Click here to see our Kickstarter video! March 21, 2015 - Bats! Red bats everywhere! In addition to the Generic System, we've also released our latest Monk-Punk offering, Isle of the Five-Leaf Clover, into the wild. Join the Society for Extra-Weird Affairs and travel the globe for adventure, fun, and weirdness. February 24, 2015 - Back from BASHCon with some new inspiration. Look for expansions to Crawlspace and Qalidar later on. We're also kind of creeping towards posting the events we submitted for Gen Con. October 17, 2014 - Welcome to Blegovia, the home of Crawlspace Gothic, our new gothic horror supplement for Crawlspace. Here you'll find gothic atmosphere, horror, gore, and lots of eye candy. Check out the cover if you don't believe us! October 11, 2014 - While we're gearing up for Carnage and PentaCon, we've also been busy working on a new gothic horror supplement for Crawlspace. Tonight we're taking a break to play some Icons, though. Hey, our games are great, but sometimes it's more fun to play something you didn't design. August 22, 2014 - Back from a particularly amazing (people keep telling me it's not cool to say "awesome" unless you mean it in the old timey sense) Gen Con and the blogs are already starting to pop up. Click on the white box off to the right to see the awesome (That's right, I said it! Whatcha gonna do about it?) stuff we've got in store for Carnage. August 2, 2014 - There's a prototype version of Tom's post-apocalyptic Glow RPG up for sale as a PDF, but mostly we're just getting ready for Gen Con. Come find us in the Studio 2 block at Booth #1317. June 25, 2014 - Wondering when there's going to be a Qalidar book that you can actually take off and run your own campaign with? Here it is: Qalidar: Resistance - Basic. Also, Snow is now available in print and there's some talk of Tom's post-apocalyptic Glow RPG being finished soon, too. We'll see. June 2, 2014 - Going to be In the central Florida area next weekend? Come visit Tom at Salty Bay Con! And, of course the Summer of Cosmic Horror continues in a different hue with Cave of the People-Eater by Douglas Mitten. Be on the lookout for something new from Qalidar late this week or early next week as well! May 28, 2014 - The Summer of Cosmic Horror continues in a different shade with Cave of the People-Eater by Douglas Mitten. We're also gearing up for Cleveland Concoction this weekend. May 19, 2014 - Little known fact: According to Professor Kopfy, Tunnels & Trolls got the H.P. Lovecraft bug a couple of years before the Call of Cthulhu game was published. "Mad" Roy Cram continues the tradition in The Foggy Island Horror, available now on DriveThruRPG and its affiliates. And hey, don't forget to sign up for your Gen Con events! March 28, 2014 - Keeping the Swamp of Doom from going over to the dark side has never been easy. The crocodile folk and the demons aren't helping. Check out our latest Peakvale adventure here. March 10, 2014 - The Qalidar Quick Start is here! Try out Qalidar: Resistance and pay whatever you feel like paying. Also, we've got the Gen Con 2014 events for Peryton Gamers posted. February 24, 2014 - Back from BASHCon! Had fun hooking up with old friends, meeting new ones, and playing some great sessions of Crawlspace Deluxe, Glow, Tunnels & Trolls, Qalidar, and AD&D. We've gathered a few blogs about it if you'd like to hear more. February 4, 2014 - Crawlspace is now Crawlspace Deluxe! We've made a few minor rules changes, added a free adventure, and slapped a brand new cover on it. Check it out now either in print from Amazon or PDF from DriveThruRPG. November 22, 2013 - We hope you like your Thanksgiving tabletop full of dark meat. Turkey Day is an R-rated Crawlspace and it's not your ordinary slasher flick! November 8, 2013 - Missing Carnage doesn't mean we're not gaming! Fresh from the playtesting pits, here's Party Nights, the first published scenario for Crawlspace 13. October 25, 2013 - Just in time for your late night Halloween RPG session, we've got Scott Malthouse's mystery horror scenario for Tunnels & Trolls, Death at Grimwood Hall. It's a romance worthy of Hammer horror, complete with British spelling. Don't shamble into Peakvale without it! August 21, 2013 - Gen Con rocked! We'll have some blogs up soon, but in short, we had a lot of fun gaming, saw a bunch of old friends, and met lots of cool new people. Qalidar: Resistance and Crawlspace 13 both got a wonderful reception. Now it's time to polish off a few more books and get ready for Carnage. June 30, 2013 - People are always telling us how tacky Tom is, which gave him an idea. Throwing together some playing cards, some classic horror movies, and some stuff he found under the floorboards, he came up with Tom's Action Card Kit, TACK for short, and built a whole new Crawlspace addition with it. Live the life of a B-movie actor stuck in the genre, a world you never created! June 1, 2013 - Back from a very successful Dark Gathering. Tom and Robin both have pictures and stories to tell about that. Also, Roy Cram has given us another great Tunnels & Trolls adventure for New Khazan! This time it's a GM adventure full of fun... or... something that sounds like "fun." Whatever! It's called Baloonka: Rescue From the Fungus Planet. May 1, 2013 - It's Beltane, and Tom is about ready to send TROTT Crawlspace down to the editing pits. On top of that, he's already hacking away at the new improved TROTT version of SPACERS. Christina has shelved the fiction project and, along with some very talented artists, is hard at work making Qalidar: Resistance every bit as awesome as it deserves to be. This Gen Con is going to be the best yet! Check out the Peryton Gamers Events page to keep track of our schedules. February 18, 2013 - BASHCon was amazing. Jerry already has some thoughts posted about the evolution of the Ragnarok event. Expect Tom and Robin to follow shortly! January 26, 2013 - Hey, web page update! Hopefully things will be easier to find this way than they were in our old "sea of books" format. If this doesn't turn out to be any better, we might try to fix it in another five years or so. October 21, 2012 - Ready for Halloween? Not yet you aren't! The Hallween Issue of Elder Tunnels is here! Buy it now before it's too late! September 24, 2012 - While Robin's been hard at work daydreaming about how awesome her stuff is going to be, Tom got a team together and cranked out a brand new solo for his New Khazan T&T setting. Written by the infamous Roy Cram, edited by M.E. Volmar, and illustrated by Jeff Freels, When Good Games Go Bad is about as far from a game gone bad as you can get. July 27, 2012 - For Gen Con this year, we've upgraded New Khazan with another round of professional edits, new art, and a bit of layout tweaking. The print version will be ready in a few days, but you can pick up the PDF at DriveThruRPG right now (or, if you already bought it, just check your account to download the latest version). On top of that, we've re-tooled Qalidar to fit in with the upcoming line of Qalidar-related products, converted it to the Peryton RPG rules, and thrown in an introductory adventure to get you started in the Storm. May 20, 2012 - Just in time for summer, Peryton Publishing brings you... wait, what? Snow? Um, I think I've got the wrong press release here. But hey, just in case it's true, check out this new adventure for only a buck, compatible with Peryton RPG, Labyrinth Lord, Basic Fantasy, and Tunnels & Trolls. Mmm, nice and cool. March 19, 2012 - New Khazan owners! If you write up an approved article with scenarios or additions to the 9,000 Worlds, you get to join the TrollStar Club. This means you get free PDF copies of The Quest For TrollStar episodes as they come out. The nefarious Roy Cram is the first member of this club, thought up today at 1617 EST USA. And don't forget to hack your way out of Peakvale or you'll never see those stars again. Hook up with your guide in No Fences to Mend and It Came From Beyond the Stars. February 26, 2012 - Can your delvers survive Kopfy's Swamp of Doom to reach the Temple of the Hag? Find out in part one of the series, No Fences to Mend, written for Tunnels & Trolls 7.5, but easily adaptable to other versions. Don't talk to the frog. February 2, 2012 - Happy Groundhog day! Yeah, we don't care, either. What we do care about is that we're going to have our own space in the exhibit hall at this year's Gen Con! Stay tuned for details on where it'll be, but if you remember to look for Studio 2, you'll find us nearby. Also, while we were operating on radio silence, we, along with a certain delver of trollish extraction, came out with It Came from Beyond the Stars!, a Lovecraft-flavored GM adventure for Tunnels & Trolls. November 26, 2011 - An ancient signal from a world devastated by loose magic and radiation! Could this be all that remains of the legendary Trollworld? Find out in Glow World, the second scenario in Tom K. Loney's epic Quest for Troll-Star adventure for the New Khazan campaign setting. October 17, 2011 - The long-awaited Halloween issue of Elder Tunnels is here! This abominably capacious codex is hideously bulging with unholy treasures, including solo adventures by David R. Crowell and Jeff Freels; GM adventures by Scott Malthouse, Mike Larsen, and Ken St. Andre; a short story by Neil Riebe; and two bonus monsters, one with an accompanying piece of flash fiction by Katje Romanov. August 20, 2011 - Back from another Gen Con. Check with Tom and Robin for all the good stuff about that. And, well, you probably won't be interested in this. I mean, it's hardly worth mentioning, but there is a new issue of Elder Tunnels out now. Don't get excited or anything. It's only bigger than ever, packed with GM adventures and even a solo. No big deal. July 7, 2011 - The guy who did those awesome drawings in Elder Tunnels and created all that wonderful stuff of his own (including Bean!) needs help. Please consider buying lots of stuff from Jeff Freels or donating to his transplant fund really soon. Click here for the whole story. June 28, 2011 - Another Troll Hoot is past. As always, Tom and Robin have blathered on way to long about it in their blogs. Gen Con preparations are underway. Just look for "Peryton Gamers" in the registration widget to find our events. There's a lot of 'em. In other news, there's a cat on my desk. May 16, 2011 - It may look quiet here, but that's only because we're too busy cackling over our own schemes to stick our heads up and say hello. We've got the "exotic locations" issue of Elder Tunnels in development for one thing, and a whole line of books for the Peryton Fantasy RPG is almost ready to start shambling into the daylight. There have been rumors of a Troll Hoot, but our lawyers have advised us not to comment on the matter at this time. April 2, 2011 - Well, we've already sold out of yesterday's Adult Adventures Series, but hey, to make up for it, we've got a new issue of Elder Tunnels out! This special Science & Sorcery issue edited by Christine Crabb features genre-bending adventures by Michael K. Eidson, Tom K. Loney, Brian Penn, and Joe Weinmunson with a cover by Darryl Nichols and interior art by Jeff Freels, Mike Hartlieb, and Christopher Rowan. April 1, 2011 - This week, Peryton Publishing will be releasing its latest role-playing innovation, the Adult Series: RPG scenarios for the Pathfinder RPG and FUDGE rules system for unadulterated mature entertainment. Authors Ken St. Andre, Tom "Kopf" Loney, Hugh J. Hefner and Christine "Columbo" Crabb have thrust their long pens and juicy creative fluids into these tightly written portals to steamy, titillating adventure. With the art of S.Z. Crompton, Marcus DeParamour and Nigel Lowslo, we're proud to bring you some of the the finest R-rated and X-rated D&D scenarios ever designed. March 11, 2011 - Another great BASHCon has passed, and of course we blogged about it. Robin blogged here, while Tom blogged here, here, and here. Also, Tom made some progress in his quest to bring the Good Word of Tunnels & Trolls to the world, possibly developing a couple of new writers for us, one of whom is already doing some serious world-buliding. February 14, 2011 - Happy Commercial Exploitation of Attachment Day! No new products today, but we do have some new monsters since the last time we updated here. New creatures for the Peryton Fantasy Role-Playing Game appear every friday on Robin's Blog. We'll be at BASHCon in Toledo this weekend running Peryton RPG, Tunnels & Trolls, TAG PowderPunk, TAG Glow, and Call of Cthulhu, so drop by and say hello if you're in the area. Check out the con, too! It's one of our favorites. January 15, 20 - Just posted another new monster for Peryton RPG and a magic item, and some new information for Loar, which is now slated for a Gen Con 2011 print release. Oh, and by the way, the Cloudbusting scenario for New Khazan, part one of the Quest for Trollstar epic, is now available in PDF for only $1.50! December 29, 2010 ...and we're more than halfway out of the dark! Next year we're going to step up our support for Peryton RPG, keeping up the freebies (and eventually coming up with a better archive for them), putting out low-cost but awesome supplements in PDF, and, believe it or not, we're finally going to get Loar out. On top of all that, we're going to launch a whole new flavor of TAG, and we're going to put New Khazan on store shelves. And that's not even touching our convention plans. Wait till you see what we're cooking up for Gen Con! November 21, 2010 - Back from Carnage 13 and done with a great holiday weekend. We've got summaries from Tom and Robin on the convention. We've also got the latest SPACERS epic going strong. Check it out on Infrno.net. Look for some new Peryton RPG stuff in the near future, and a Freddy Tampa mystery adventure for WHAP! October 14, 2010 - Get ready for Halloween with four ghoulish Tunnels & Trolls adventures (three GM adventures and a solo) by a variety of authors and a chilling introduction by Scott Malthouse of Trollish Delver fame. That's right, it's time for the 2010 Elder Tunnels Halloween Special! October 10, 2010 - Happy Binary 42 day! If 101010 isn't exciting enough for you, another thing you could celebrate is Ken St. Andre's Fragmentary History of Trollworld, entirely re-written by the Trollgod himself and lavishly illustrated by David A. Ullery and others. September 22, 2010 - Not getting enough pulpy justice in your diet? Try "The Night Devil," a new free online story by the uncanny John "Myth" Kennedy. August 25, 2010 - New Khazan is here! More than elves and trolls in outer space, more than star warriors casting spells, New Khazan has its own unique flavor of space fantasy. Find out all about it by clicking here. August 12, 2010 - Back from Gen Con with the full scoop from Tom and Robin. Pits of Paneris, the first of our Three-Dollar Theater line, is now available in PDF format for Peryton RPG, Pathfinder, and True20. Soon it'll get its own page, but for now here's the scoop: Three-Dollar Theater gives you a short story combined with all the gamer crunch you need to put your players in the same circumstances. June 18, 2010 - Are you ready for a three-way? You know we're talking about three WHAP adventures in one printed book, right? Right? Howls in the Wild brings you three scenarios previously only available in PDF form: The Silver's Jungle by Tom K. Loney, The Black Lotus affair by Mike Larsen, and Cowboys vs. Dinosaurs by Ken St. Andre. From African jungles to remote snow-capped mountains to the Old West, this book pits you against rogue apes, takes you around the world steampunk style, chases you with dinosaurs, and might even give you a chance to foil a vile plot hatched by skulking proto-Nazis. June 12, 2010 - Following hard on the heels of Ken St. Andre's infamous Cowboys vs. Dinosaurs is the even more infamous* Ogreocre card game! Get it now in PDF format from DriveThruRPG or as a full color printed booklet from Lulu. *The above-referenced degrees of infamy may vary depending on your personal experience. Subjective infamy should not be taken as a guarantee of actual notoriety. June 3, 2010 - Ken St. Andre's infamous Cowboys vs. Dinosaurs is here! This adventure, designed to be played with the TAG WHAP! rules, was originally run by Ken at the second annual Flying Buffalo Tunnels & Trolls Convention in Arizona. We've dressed it up with some original dino-cowboy art by Mike Hartlieb, edited it, and formatted it so that you can take home your own digital copy via the Series of Tubes right away. May 18, 2010 - We've got a new version of Qalidar out on DriveThru for "old school" systems. I guess it's okay if you like Qalidar. Take a look. Or not. We might set up a print version eventually, too. Also, the link wasn't working with the picture on this one, so I got tired of messing with it and gave up. Go find it yourself. I can't do everything for you people. May 10, 2010 - The latest addition to our WHAP! adventure line, Mike Larsen's Black Lotus Affair, is now available at DriveThruRPG. And while you're here, check out our revised "shop" page. May 2, 2010 - Just in time for Zombie Awareness Month, allow us to present the long-awaited Zombie Zigzag for TAG's Crawlspace Horror Role-Playing System. Meaty enough for even the most savage flesh-eater, this supplement contains new zombie-related rules, two adventures, and an original short story. Get yer braiiinnnssss right here! April 15, 2010 - Tomorrow, on FRIDAY, THE 13TH product from Peryton Publishing, CRAWLSPACE™ goes on sale. Though it is not HALLOWEEN, the horror rules set for TAG is just in time for the slew of SCARY MOVIEs that mark the Summer. Though humor is prevalent throughout the work, the GM can still instill NIGHTMAREs fluttering ON the leaves of the ELMs along your STREET, while the players can be the HELLRAISERs that they want to be. TAG's CRAWLSPACE™ will be available at DriveThruRPG.Com April 16th, 2009, at 5pm EST (GMT-5). Part of our on-going "RPG's For a Buck" Series. April 3, 2010 - Want to try out the revised Peryton Fantasy RPG really cheap? Check out our Peryton Basic PDF over at DriveThruRPG. It includes everything you need to play character levels 1-3 and features The Dark Cave, a short adventure by Tom K. Loney (currently not available anywhere else) to get you started. March 19, 2010 - Our first Elder Tunnels collection is here, just in time for St. Joseph's Day (whatever that is)! Elder Tunnels is 100% Trollhalla Friendly, designed primarily for T&T 7.5, but easily adaptable to other editions. And TAG Crawlspace is shambling right along. In fact, IT'S RIGHT BEHIND YOU! February 27, 2010 - Our Elder Tunnellings are getting dangerously close to breaking the surface, and check out the sneak peak (below) of our upcoming Zombie Zig cover, painted by Darryl Nichols. January 26, 2010 - Troll Hoot! Troll Hoot is coming! Troll hoot is coming! And there's a link! January 17, 2010 - Thanks for all your support with the PeryPub 2010 Art Funding Drive. We got 80% of what we were asking for, which is enough to work with! January 4, 2010 - To help us start the new year right, allow us to announce the PeryPub 2010 Art Funding Drive. For a mere $40 (US), ten lucky (disclaimer: luck not included) patrons can help finance the artwork, co-writers, and editors on our projects. What will this get you? If only we had Vanna White to show the prize... Oh, and Troll Hoot 2010 has found a home. August 19, 2009 - We're back from Gen Con and so is the new Peryton Fantasy RPG! Order a copy today, then go read Kopfy's blog and take a look at some more Gen Con pictures. July 14, 2009 - WHAP Deluxe is here! This is the deluxe upgraded Wildly Heroic Action Pulp (WHAP) system for Tom's Adventure Gaming, designed for Western, Steampunk, High Adventure, and other cliffhanger staples. Built from the Tom's Adventure Gaming (TAG) system, it includes all the rules you need to get started playing. This product also includes "The Wobble Machine," an introductory adventure that shows you just how far WHAP can take you. Information on this year's Zombie Walk is posted now. Click here for the lowdown on the big shamble of 2009. June 24, 2009 - Origins is coming! Okay, for some people it's already started, but we won't be there until this weekend. Look for shiny new TAG, T&T, and Peryton RPG events run by Tom & Robin. We won't have our own booth in the exhibit hall, but look for our stuff at the Studio 2 booth. That goes for Gen Con as well: remember Studio 2 → Peryton. Seeya there! June 4, 2009 - MARCon was a lot of fun, but not very strong on the gaming. See Kopfy's Blog where he whines about his foot and makes a couple of brief references to the con. In the cool news category, click on the red peryton over to the right to find out about Peryton the musician and check out some of his music. Supplies are very limited so order soon! I know everybody says that, but really, we don't have many of these. May 18, 2009 - MARCon is coming up this weekend and we'll be there to run some world-hopping adventures for True20 and BRP, a Tunnels and Trolls adventure, and another go at an old Peryton RPG mainstay, "Escape from the Artificer." More news on upcoming products after the con. April 2, 2009 - So no one bought that we were going out of business in two weeks? Okay, next year will be funnier. Fans of the popular gaming download store DriveThruRPG will soon be finding more and more of our products there. Our first DriveThru release (also soon to be appearing on game store shelves everywhere) is Qalidar. Also, POW!erful Tales is now available for purchase and our Silver's Jungle and Wobble Machine PDF's are burning up the modems! April 1, 2009 - ...Buy now because we're going out of business in two weeks. Turns out we hate games, and we're not too sure about this World Wide Interweb thing either. March 25, 2009 - Our second Cliffhanger PDF adventure for the WHAP! system is here! In The Silver's Jungle, the player characters are summoned to Bogo, a port city in the western Belgian Congo, by the governor himself to investigate a series of murders, believed to have been performed by a rogue silver-back guerrilla and then resolve the situation. Download it today for only $4.99! March 8, 2009 - POW!erful Tales is coming soon! For now, though, we have a special PDF treat for you, our first Cliffhanger adventure for the WHAP! system. In The Wobble Machine, an introductory scenario for TAG's WHAP! pulp adventure system, heroes are charged with investigating mysterious raiders who are stealing artifacts from across time, and capturing the technology they use to do it. Download it today for only $1.99! February 12, 2009 - And now for the announcement we promised: Troll Tunnels is now available for Amazon's Kindle Reader. You can download the whole book, including all the full-page illustrations, for $5.59, unless you don't have a Kindle, in which case it's $364.59. That last part will probably not be mentioned in future advertisements. Also, if you're a retailer, you can now order our stuff through Alliance and other major distributors world-wide. Drop us a line if you're interested in carrying something that we haven't made available yet and we'll bump it up in the roster. February 4, 2009 - Snowy greetings from Burning River City! Expect a surprise bit of news from us in the next few days. I can say no more! December 15, 2008 - Submissions have closed for POW!erful Tales and we're busy putting the book together. We're not really intersted in looking at stories for our other upcoming collections just yet, but we'll be happy to sit on them for a few months and ignore you until then, if you want to go ahead and send them anyway. Oh, and best of the Thanksgivoween season to you and yours! Qalidar will stay at its discounted rate until the end of the year, after which it goes up to $14.99, so get it extra-cheap while you can! It's getting great reviews so far. November 10, 2008 - WHAP! #1 has gone into hiding for revision, but you can still download the rules for $0.99 and the adventures will be back soon. And now, at long last, Qalidar is ready! Pick up this dark, uniquely stylish fantasy setting for the True20 game now at $11.99 because the price will go up soon! October 21, 2008 - The first Christina Lea episode of Voidfarers is now available in the "free novel" section. Qalidar may be pushed back to November because the cover artist's computer crashed. He's darn good, though, so really, it'll be worth the wait. In the meantime, don't forget to take a look at WHAP!, featuring new writer Michael Larsen (who is big into something he calls Rock'n Role-Playing), new editor Lad Hannes, and that same old Tom K. Loney guy you're already tired of. October 6, 2008 - Con on the Cob is over, and now... WHAP! No, that's not you being scolded for spotting the carpet; it's three new Wildly Heroric Action Pulp adventures by Tom K. Loney and Mike Larsen, bound into one big 70-page book with TAG rules and sample characters, and slamming its way into your mailbox for only $8.99. Get your copy now before we roll it up and hit you with it! Later this month, expect the next shot of our free online serial, Voidfarers, along with the commercial release of Qalidar, maybe a revised Peryton RPG, and Halloween. August 29, 2008 - Kind of coming out of nowhere this month (well October really) is our new Saga, Wildly Heroic Action Pulp: WHAP! for TAG. Our "staff writer," Mike Larsen has been the major push behind the scenarios you'll be reading, even if he just doesn't talk about it a whole lot. Really, he just drops about six adventures within six weeks, and we were looking for some new stuff to present at Con on the Cob. It's Peryton's turn at our Voidfarers story. Let's wish her luck... as soon as she's done with Qalidar... and Peryton RPG... and Loar. Qalidar, at least, will all polished up with a special limited signed and numbered edition at Con on the Cob. Con on the Cob will be the only place you can buy this early edition. The standard edition will be available for purchase for everyone else a couple of weeks later. The sequel to Troll Tunnels already has submissions, and POW!erful Tales is filling up as fast as MC Lea can sort through the submissions. August 9, 2008 - Between Flying Buffalo Con and the upcoming GenCon this month, things have been a little tight here, but at last the second chapter of Voidfarers is ready for viewing! Speaking of fiction, we need submissions for fiction! Some of us are already working on the sequel to Troll Tunnels, Tunnels and Trouble, we're thinking of calling it. Robin is busy plugging away at her Peryton RPG revision and Qalidar, while Tom, aka Kopfy, aka the Laggy, is mostly just keeping up with the scenarios he's lined up for the conventions. Fear not he's still getting things done! Also, TAG has been getting a lot of interest these days, so here are some spiffy character sheets for SPACERS and RuinCrawl. There's even one for the WHAP! play-test sessions we've been having. It's taken us three years, but hey, you know, we were, like, busy or something. July 1, 2008 - We've got two long-promised Peryton creations ready to poke their horns into the light this Autumn, and one brand new one. First is Loar: Lair of the Minotaur, a mid-level adventure for the Peryton Fantasy RolePlaying Game. Also ready to thaw out from a long hibernation is Qalidar, Lost City of the Perytons. Qalidar will be our first product under Green Ronin's True20 license. Finally, we're putting together a revised and corrected edition of Peryton RPG. Don't worry - this version and all its supplements will be fully compatible with the current one because it is, in fact, the same game. It's just rearranged to help make it even more improvisation-friendly and to add some new goodies. All three products are due for release this October, although Loar and the PRPG revision may sneak out earlier. Oh, and Troll Tunnels just keeps on selling. Thanks! June 18, 2008 - Voidfarers, Chapter 1 is now posted! This chapter introduces the heroes (readers of Troll Tunnels will already know Sash the Green) and future supplements will come around the 15th of every month. And hey, it's the convention season! We hope to see you at Origins, the Flying Buffalo Convention, GenCon, and our favorite, Con on the Cob, this year. May 31, 2008 - This month, we're rekindling Sash the Green's (of Troll Tunnel fame) first appearance with the on-line release of the Voidfarers novel in monthly installments. The story has been totally revamped and written by Michael Eidson, Christina Lea, and Tom K. Loney. We're starting with a short prologue right now, to be followed on June 20th by the first full chapter. May 2, 2008 - Troll Tunnels is here! For only $9.99, you can own this solid collection of sword and sorcery tales by Michael K. Eidson, Christina Lea, Michael Lea, Tom K. Loney, James L. Shipman, and Ken St. Andre. In addition to its 166 pages of fantastic prose, Troll Tunnels also features a painted cover by Simon Lee Tranter and interior art by Régis Moulun, Mike Hartlieb, and Diego Gisbert Llorens. As the Trollgod himself (Ken St. Andre) says, "you should buy a copy"! April 1, 2008 - The Troll Hoot is almost here, and with it, the next revolution in gaming! Tired of cumbersome rules and dice getting in the way of your role-playing? Disgusted with game designers deciding what your character can or can't do? Are you ready to set your imagination free? Then maybe you're ready for Stare at the Wall! Also, you could scroll down to the saga section and check out Stone's Edge for wild Ice Age fun with TAG. March 16, 2008 - In honor of St. Patty (that's our story and we're stickin' to it) the complete TAG sci-fi (FreeFall) rules are now available for only 99 cents! This is in addition to the RuinCrawl rules released earlier this month. These downloads provide the all the rules without the adventures. Perfect if you just want to run your own campaign with TAG or try out the system for less than a dollar! Go to the TAG page for more information. And lest we forget, our Troll Hoot and the short collection, Troll Tunnels, are coming in April! March 3, 2008 - Alas, poor Caesar, we have not forgotten thee! For as you lie awaiting the Ides of March, we shall give unto you what is yours and make available special PDF's of the TAG rules systems. As of today, you can get yourself a copy of the complete TAG fantasy (RuinCrawl) rules for only 99 cents! Also coming this month will be the Spacer rules. These downloads provide the all the rules without the adventures. Perfect if you just want to run your own campaign with TAG or try out the system for less than a dollar! Friends, GM's and citizens, cry havok and let loose the dogs of war with TAG! Click here to buy the RuinCrawl rules or go to the TAG page for more information. And lest we forget, our Troll Hoot and the short collection, Troll Tunnels, are coming in April! January 7, 2008 - Not only is there a brand new Troll Hoot on the horizon (early April) with some great events and a spiffy poster, but we're going to have some special stuff ready to show off when we get there. This includes the long-delayed Loar: Lair of the Minotaur module for Peryton RPG (with the infamous owlbear dilemma that we so love to spring on unsuspecting convention players) and possibly even the Troll Tunnels short story collection! December 31, 2007 - On the edge of a new year, we just wanted to share a few words borrowed from the Doctor. "It's all waiting out there. Everything's brand new to me: all those planets, creatures, and horizons. I haven't seen them yet - not with these eyes. And it is gonna be fantastic." December 9, 2007 - With the New Year fast approaching, we'd like to thank Si, Ziggy, Armbruster, Monk, Pneumonica, Regis, Diego, Mandy B., Caed, DCRaygun, de Castro, and MCLEA (with a special tip of the non-existent hat to Stony for helping out with certain secret projects) for all their help in making Peryton Publishing a quality joint - online, in print, and in person. And we'd like to thank all of the new customers and contributors that are helping to make 2008 look like a fairly fun and successful year. Just in time for Christmas, Kopfy's Caverns is here! The second annual Troll Hoot is in the works. POW! is on its way, with great art accompanying our humble TAG rules. The Peryton RPG is gathering material for a serious release of some scenarios. Last but not least, our fiction release Troll Tunnels is well underway. November 16, 2007 - Back from Con on the Cob, but we'll be traveling again soon for Thanksgiving, then putting stuff together for Troll Tunnels. This means we are interested in submissions if you've got a sword & sorcery tale you'd like to share. Check the "contact" page for information on rates. October 23, 2007 - It's not ready for sale yet (we're sill playtesting) but Simon Tranter's cover for the upcoming POW! (Powers Out of this World) game so totally rocks that we've got to show it to you anyway. We'll be playtesting "What Price Liberty" at Con on the Cob this year so stop by and see us if you'd like a closer look. Like all TAG adventures, this one will include all the rules you need to run not only the adventure itself, but a full campaign of your own. We're running three events at Con on the Cob this year: Powers Out of this World (the aforementioned TAG superhero game), The Dark Cave (Peryton RPG), and Return to Sihlt-Awash (TAG fantasy). October 17, 2007 - Curious about the Peryton RPG but not sure you want to buy the whole book? Now you can get an abridged but fully functional edition, complete with sample adventure, all the new classes, and the full details on knacks, magic item creation, and the Peryton advancement system, for less than a dollar. You can get to Peryton Lite from the Peryton RPG page or by clicking here. September 4, 2007 - Having braved the fires of Gen Con and been re-forged, our latest FreeFall adventure, Rocket-Men vs the Saucers II: The Straits of Sub-Light, is now being distributed to the masses for a mere $7.99. Like all TAG adventures, Straits of Sublight has all the rules you need to play right in the book, so call your friends, get out your rayguns, and see if you can save the Icarus X-1 before it disappears from our universe forever! August 25, 2007 - Back from Gen Con. Read Kopfy's Blog for more on that adventure. Soon we'll be releasing the commercial version of the FreeFall, Rocket-Men vs the Saucers II: The Straits of Sublight. Also, due to better-than-expected sales, we're lowering the price of Imp Hollow and future publications of the same size to $7.99! August 07, 2007 - We've just put together a special treat for a lucky few among those of you who find us at Gen Con (Indy) this year - a slick printed version of Rocket-Men vs the Saucers II: The Straits of Sublight with a cover by Simon Lee Tranter and interior art by Régis Moulun! Sure, the regular edition will be for sale here later, but you'll only have one chance to snag one that says "Gen Con 07" on it. Unless you write it on there yourself, of course. But that's just tacky. We're signed up to run five events at Gen Con '07. July 29, 2007 - Today's news should be fairly obvious: NEW WEB PAGE! Pop by the forum and let us know what you think. July 24, 2007 - It's here! Our first TAG adventure, Imp Hollow, is ready to buy. Click it in the "On Sale Now" column or just click right here to find out more about this fantastic new supplement featuring art by John Armbruster, Diego Gisbert Llorens, Andy Hopp, Régis Moulun, and more! July 22, 2007 - Coming veeerrry soon: our first TAG adventure, Imp Hollow. This scenario will also contain all the rules you need to play it, so the Hollow will be a complete game session between two covers (players not included). And just so you know we're serious, here's the cover, courtesy of Diego Gisbert Llorens. June 23, 2007 - Something about Free RPG Day. Forgot to copy the original post before updating last time. Oops. June 4, 2007 - The forum is back online. Thanks to Pair Networks for responding so quickly (on the weekend even) and being ready for this kind of thing in advance. June 2, 2007 - Yes, the forum is down for right now, but it will be back. We're working on it. April 2, 2007 - We're back from the Troll Hoot, which was... well... a hoot. All the good dirt can be found at Kopfy's Kreche (linked in the "Never Click Here" box, below). March 31, 2007 - Laggy's Adventure Gaming (LAG) is now Tom's Adventure Gaming (TAG). For more information, see the forums. Development has begun on Isun, the next World of Elder supplement. More news may be forthcoming after we get back from the Troll Hoot. February 20, 2007 - We're through with MegaCon, Athebes is still looking good, and everything is on track to make this an eventful spring and summer. There's even a facelift for the home page coming up. Keep your eye on this space and the forum for more news. January 4, 2007 - Happy New Year! 2007 is going to be the Year of the Peryton! This is not as horrible as it may sound. We've got a new string of freebies rolling out starting this week, we've got Athebes streaking through final draft phase, and there are minotaurs and spacemen peering over the horizon. Sure, a few unfortunates may be gored and eaten by malevolent flying beasties, but they probably had it coming! December 8, 2006 - Thanks to Mister Simon Lee Tranter, Athebes has a cover! Scroll down a bit and take a peek. And if you like that, you'll love what's inside! We're looking at a release date around January 15 for the book. November 5, 2006 - We're back from Con on the Cob which, by the way, totally rocked! Thanks to Kali Z. and Rob B. who helped us playtest Ruin Quest. We also met some great new artists and played some cool games, and now we're ready to get back to work. Look for a free PDF supplement to Peryton RPG within a week or so, and Athebes sometime this winter. October 19, 2006 - Con on the Cob is coming! Don't forget to look for us there. We'll be running two LAG adventures and a Tunnels & Trolls session. Athebes has been postponed a bit, but it should still be ready by mid-winter. August 20, 2006 - Gen Con is over and we're getting ready for Con on the Cob with two LAG adventures and a Tunnels & Trolls session. Peryton Fantasy RPG is now available online and we're putting the final touches on the Athebes setting for this fall. August 1, 2006 - The Peryton RPG is ready to order now! Also, don't forget to check out our new Rocketmen vs the Saucers teaser in Upcoming Events and Ruin Quest in the Developing Projects box. July 27, 2006 - It's on its way! If all goes according to plan, the Peryton RPG will be ready to order by the middle of next week! And don't forget to check out Ruin Quest in the Developing Projects box. May 14, 2006 - We've rearranged the front page a bit to give you more information on Athebes, the Primal Land, a new setting we're planning to put out in October, so scroll on down and check it out. April 22, 2006 - Scroll down for a bit of a treat. That's not quite what the final layout will look like, but it does give you an early glimpse of Janeen Satone's fantastic cover art. The Peryton RPG, as previously stated, should be ready for release this August at the very latest. March 22, 2006 - Everything but the gloss is done on the Peryton RPG. Also, keep checking back for updates on our convention events. If all goes according to plan, we'll be running introductory adventures for both Peryton RPG and L.A.G. at Gen Con Indy 2006. December 19, 2005 - Okay, so we paused a bit to play with something new: we have our very own forum now! Stop in and say hi. Or else. Now I guess we'd better get back to putting out some actual products, eh? In other news, Laggy's Adventure Gaming system (L.A.G.) is back on the development roster, and the Peryton RPG is almost ready. October 22, 2005 - Work on the RPG project has really picked up. We're almost ready to give you a taste. In the meantime, we've at least added a bit of peryton lore for the curious. Scroll down to learn more about these mysterious creatures. September 13, 2005 - For one thing, you might have noticed the new entry in the "Upcoming Events" box over to the left. Second, playtesting on the Peryton RPG has revealed a few rules that need to be tweaked, and of course we're still hard at work turning all these notes into something that makes sense and looks pretty. August 23rd, 2005 - We're back from Gen Con and we've still got tentacles on the brain. Met some great people and played a lot of games. Now it's back to work, slaving over a hot... okay, room temperature keyboard and getting our own game back on track. As you can see, we at least managed to make a few more changes to the web page and more are coming! 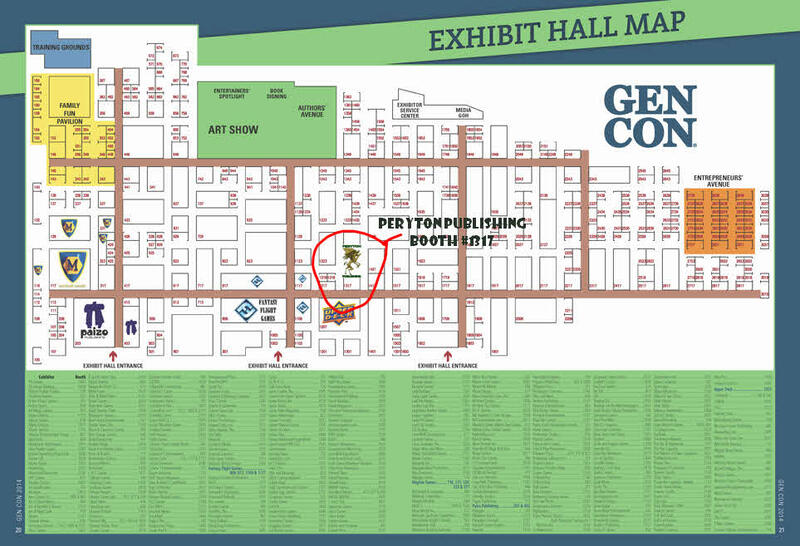 August 15th, 2005 - We're off to Gen Con in a couple of days, so you won't be hearing any news about the Peryton RPG or any of our other projects until next week. Seeya in Indianapolis! August 5th, 2005 - Okay, so the False Starts announcement was a bit of a false start itself. That project will probably take a different form, somewhat later. The main reason is that the Peryton RPG is really coming along and we're focusing all our energy on that, for now. July 30th, 2005 - The playtest of Peryton RPG is going well, but we're not just sitting back and watching. Soon we'll be accepting submissions for False Starts, a fiction magazine with a theme you've never seen before, one that's probably a bad idea, even. Guidelines will be released in a week or so and then you'll see what we mean. July 21st, 2005 - The playtest edition of the Peryton Role-Playing Game™ is back from the printer and going out to several hives of scum and villainy as we speak. This game features enough core mechanics from the world's most popular role-playing game to make it easily compatible with their supplements, but has been streamlined to create a faster, more exciting tabletop experience with less bookkeeping and prep time. July 16th, 2005 - Welcome back to Peryton Publishing. We got kinda sleepy for a while, but now we're back with some new tricks and some new projects. Okay, so we still haven't gone any farther with Voidfarers or Ziggurat Builders but hey, they're not hurting anybody. Expect more printed publications. Expect to hear about a whole new take on Lovecraftian gaming and about the best d20 variant rules you've ever seen. All content (including but not limited to stories, games, other text, and graphics) is Copyright © 2004 by Peryton Publishing or the original author, and may not be reproduced without prior written permission. Peryton Publishing and the Peryton Publishing logo are Trademarks of Peryton Publishing. All Rights Reserved. Email open@perytonpublishing.com for more information.